Although it may be unseasonably warm right about now, we all know that fall is coming. Just as you'll start to switch out your sandals for boots and tank tops for coats, it will be time to switch out your natural hair regimen as well. You may have noticed that your hair needs change with the season as temperature, humidity, and the environment start to change. 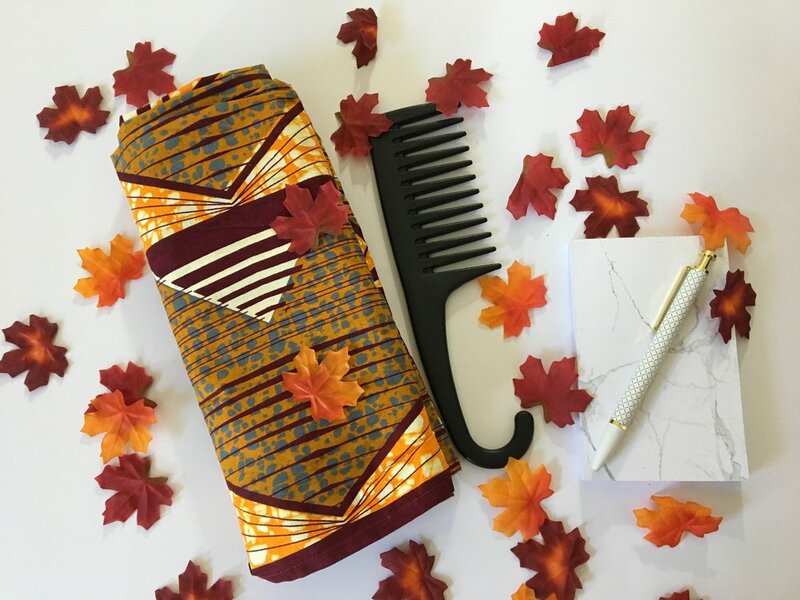 Gear up by thinking about how to switch up your hair routine so that you stay moisturized and your strands won't break off like autumn leaves. Have you ever noticed that some of your products stop working as the seasons change? As the weather gets colder and the air gets drier, hair moisture becomes a bigger problem. Switch out your gels and light oils for styling creams and butters. Also, DON'T use coconut oil on your hair in the winter. If it's solid in the jar, it will likely turn solid on your hair once you step into the cold. The constant hardening and melting on your strands can cause damage. Fall & winter is the perfect time to put your hair in a protective style. This will help your hair retain moisture longer, prevent your ends from getting snagged on your coat or scarves, and allow your hair to rest and grow. Buns, twists, braids, weaves, and wigs are all good options. Think of it as putting your hair in a cocoon to glo up into a beautiful butterfly for next summer. It may seem odd but you should definitely be deep conditioning your hair weekly in the winter, if you aren't already doing so. The air is dry and sucking out the moisture from your hair. Replenishing often will make a world of difference to ensure that your hair stays healthy. We tend to wash our hair less in the fall and winter, either because we don't have time or the weather is discouraging. However, we get the most moisture in our hair during our washes. If you aren't keeping up your weekly wash schedule, make sure you are adding moisture back in to the strands in between. I personally use my steamer to add moisture back to my hair, but the steam from a hot shower combined with leave-in might do well also. Fall fashion is cute but all that knitwear and cotton can cause breakage. Satin lined hats and headscarves can make a huge difference. If your hat doesn't come lined, opt for a bonnet underneath or sew in your own lining. Hats and headscarves are actually great ways to protect your hair from the elements, but you don't want to cause more damage in the process. How are you switching up your Routine for the Fall? Tell in the comments below or on social media.